The sacristy of 'Salute' is a small room accessible from inside Salute, to the left. There are a dozen works by Titian here, although in fairness some of them are simple heads (of the evangelists and Doctors of the church). The paintings on the ceiling - The Sacrifice of Isaac; Cain and Abel; and David and Goliath were brought here when the church was being built, from a church on the island of Santo Spirito (south of Giudecca) - that church and its order were suppressed by the Pope while Salute was being built, and it's to Salute's benefit as these works are absolutely magnificent. The custodian will helpfully lend you a magnifying mirror to get a close look at these. 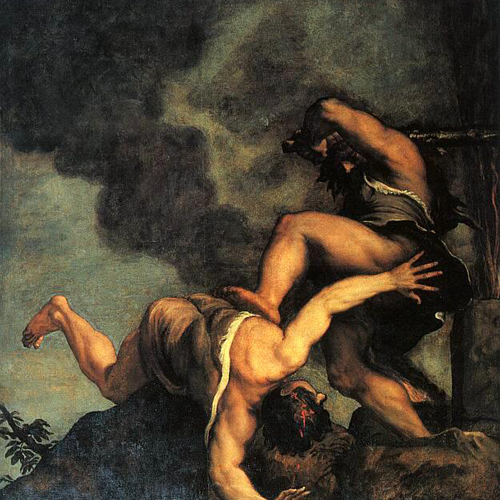 An early Titian work, this demonstrates some of the skill for which Titian would become so famous. It's a much more conventional painting in terms of its composition than many - it was commissioned as an offering to St Mark seeking his intervention in one of the plague outbreaks of the time (A common concept - the idea was that an offering would atone for the collective guilt of the town that was being punished by plague). Titian was clearly seeking maximum plague protection by including Saints Cosmas and Damian, two brothers, 3rd century martyrs, who were doctors; as well as St Roch (San Rocco), displaying, as usual, the plague sore on his leg with which he is associated - St Roch was said to have been born in the 13th century and to have cured many victims of the Black Death. St Sebastian features too, with his arrows. This painting, from an unusual angle, features Tintoretto himself in the foreground, dressed in pink, speaking to Paolo Veronese. The painting features Mary whispering to Jesus seems to show the moment before Christ turns the water into wine - perhaps Mary is complaining to him about the lack of wine? 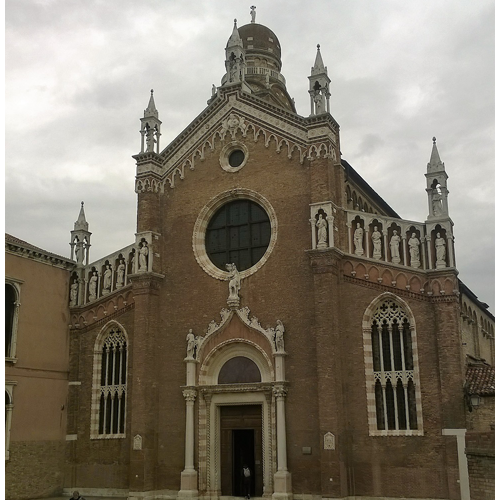 This picture is an allegory for the survival of Venice during the plague outbreak that resulted in the church's construction.